Who wants to win the Pumpkin Carving Cartridge? 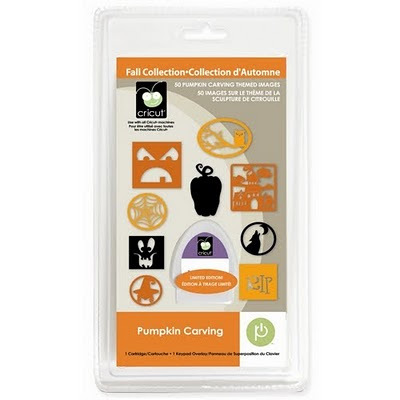 Thanks to Scrappy Sales we are offering this brand new just released Limited Edition Pumpkin Carving Cartridge. YAAAY! The rules are simple! It's that simple folks! Winner will be drawn by random.org on Wednesday at Noon EST. I have this in hand and it will ship out Wednesday afternoon or Thursday morning. SWEET!!!! just in time for halloween! I would LOVE to have this one! Thank you! Thats is the coolest cartridge ever!! I love Halloween!! I would love to win this!My kids love halloween, I so want this:) Thanks for a chance to win! What a wonderful give away! I would LOVE to win! Thanks for the chance! WOW what a great blog Candy! I love your blog and I also love Scrappy sales! Thanks to both of you!! Also a great big thank you for following my brand new blog!!! Wow, what a great give away! I would love to win this cart. Thanks for the opportunity. Love this cart... Halloween is my favorite! OK- I am going to see if I can follow directions! Hello, nice blog and sweet candy. Gotta love the blog candy! Thanks for sharing your creativity. I am now a follower! Thanks for the opportunity! Great blog! I love your blog! thanks for the opportunity to win! I'm a follower and a facebook fan! Two comments that's it? I would l-o-v-e this cart! Got to love blog candy!! wow thanks for the givaway!! !great projects. I am so excited! My son was born at the end of October almost 10 yrs ago. I have many Halloween b-day parties to scrap. This cart would be perfect. so awesome of you to give this away, Would love to own it! Oh no, I love Halloween. I need this cart. Yah! This is on my wish list! Thank you for the chance to win. What a nice give a way! Thanks! Great blog! I would love to have this cartridge! Thanks so much for the chance! Love the blog...love the cart. Want it for my very own ! Thanks Krazy Tangee! I love this Cart thanks so much for offering it to us. I just sent my email....thanks so much for the chance to win!! I love you fear and your hubby's fear quotes! I am afraid of the same thing!!! LOL! What a fun give away! I am a follower and a facebook fan! I have sent you an email too. I too love your fear and your husbands fear quotes! This would be a fun cart to win - thanks for the chance. Hello......i just love to scrapbook!! !